Wash potatoes well rubbing between fingers. Take washed potatoes into a holed bowl (Sprout Making Bowl) and place this bowl in pressure cooker. Cover pressure cooker with lid and heat it on high flame. After first whistle, cook the potatoes in pressure cooker on low flame for 10 minutes and switch off the flame. Allow the pressure cooker to cool naturally and open lid and observe that potatoes are steam cooked well. Cool the potatoes for a while and then peel the skins. While the potatoes are still hot grate or mash them to avoid lumps. To grate or mash potatoes use a potato ricer, a box grater, a potato masher or simply with the back of a glass (tumbler). Here I have used a potato ricer to grate cooked potatoes. Take a warm potato into the potato ricer bowl and press with lid into a bowl and observe that mashed potato comes out as cooked rice grains. Divide the grated potatoes into two equal parts--- each part measured 3/4Cup or 110gms. Wash green chilies and finely chop them and take them into a plate. Wash coriander leaves and pat dry with a kitchen towel and finely chop and keep them in separate plates. Take a mixing bowl and add wheat flour into it and add carom seeds, turmeric powder and salt and mix well. Add water little by little and make soft dough---here I have used 70ml (1/3cup) of water to make dough. Knead the dough till it looks soft and smooth on the surface. Cover the bowl with lid and rest the dough for 10 minutes. Heat a pan and add oil and heat oil. When oil is hot add cumin seeds and fry stirring till they splutter. Then add chopped green chilies and fry stirring till they turn crisp. Then switch off stove and add chopped coriander leaves and mix well till they wilt slightly. Take mashed potatoes into a bowl and add salt and fried seasoning and mix well. Divide the potato mixture into three equal parts and smoothen each part between fingers in a palm. Heat a pan and add cumin seeds and fry stirring on medium flame for a minute. Then lower the flame and add red chili pieces and fry stirring till they turn crisp. Take the roasted cumin and red chilies into a mortar and cool for a while. Crush the roasted ingredients using a pestle and take this powder into a plate. Take mashed potatoes into a bowl and add salt and roasted cumin and red chili powder and chopped coriander leaves. Mix all well and divide the mixture into three equal portions and smoothen each portion between fingers in a palm. Take the dough and knead for few seconds and divide it into six equal portions. Take a dough portion and press and turn between palms and smoothen it to a smooth round ball. Similarly make smooth round balls of the remaining dough portions. Take a dough ball and flatten it between palms. Using fingers press and stretch the dough from the edges. If dough starts sticking to fingers dust fingers with dry flour. Keep the centre portion slightly thick and expand at the edges. Prepare a cup with the dough ball and a portion of the stuffing in the centre of the cup. Press the stuffing with palm. Now hold the dough and rotate between palms so that it expands and rises up. Again press the stuffing inside and rotate the dough between palms. Repeat this process of pressing the stuffing inside and rotating the dough to expand till the stuffing is fully covered with the dough. Then seal the edges of the dough by pinching the dough. Turn the dough in the palm with sealed portion facing downwards. Smoothen out the surface of the stuffed dough ball between palms. Similarly stuff the remaining dough balls with the remaining stuffing portions. Cover the dough balls in the bowl with lid so that they do not dry out. Heat an iron griddle on medium flame. Take a dough ball into a palm with sealed portion facing downwards and press to flatten it. Roll the flattened dough ball in dry flour and coat evenly all over. Place the flour coated dough ball on a rolling board and start rolling using a rolling pin. If dough starts sticking to the board sprinkle some flour on top and spread evenly with fingers. Repeat this process of applying flour on the other side too. While rolling the dough lift the paratha and turn the side in intervals so that it does not stick. Do not apply pressure while rolling the dough---just roll the rolling pin between fingers of both hands. If pressure is applied while rolling the dough, there is a possibility of paratha getting rolled thicker on one side and thinner on the other side. If paratha is rolled with rolling pin just moving between fingers (with light hand) then it rotates while getting rolled and this way it expands. Observe that the stuffing is evenly spread all over theparatha. When the griddle is sufficiently hot carefully remove the rolled paratha from the rolling board and place it on the hot griddle. Roast the paratha on medium flame till small bubbles appear on the surface. Then flip the paratha using a flat ladle. Roast the paratha for few seconds on the other side also. Then apply oil evenly on the surface and flip the paratha. Roast for few seconds and apply oil evenly on the other side of paratha and flip it. Turning the sides roast theparatha well till light brown spots appear on the surface. Then take the paratha with flat ladle and place it into a serving plate. Similarly roast all the parathas. Serve hot aloo parathas with a raita of choice. Potato stuffing can be made in many different ways of choice. Stuffing is made in two different ways and they taste slightly different from each other yet both varieties taste good. One can also add chopped onions and make stuffing for parathas. Adding turmeric powder to the dough gives a nice color to the parathas. Carom seeds add a special taste while eating parathas. Generally for one cup of flour half a cup of water is required to make soft dough---but add water slowly and make dough to have control. Resting the dough makes it soft and pliable---it stretches easily. Steam cook potatoes so that they do not absorb more water and become mushy. Mash or grate potatoes while they are still warm so that there would not be any lumps. Fry cumin seeds in oil till they splutter fully---for this make sure that oil is sufficiently hot before adding cumin seeds. Fry green chili pieces well in oil so that they do not taste hot but the flavor is released into the oil. 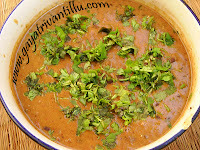 Add coriander leaves to the hot oil and allow them to wilt slightly so that it releases its flavor. Break red chilies into small pieces so that it would be easy to grind the roasted chilies in a mortar and pestle. Use the method shown here to stuff the potato mixture in the dough so that it evenly covers the entire portion. When rolled one can observe that the stuffing is evenly spread all over the paratha. Using an iron griddle is advisable to roast the parathas for better taste---however a non stick griddle also works well. While rolling the paratha do not use more dry flour---use just sufficient quantity or else the surface gets black spots when roasted on the griddle. Never roll the parathas with pressure or else they stick to the rolling board and gets rolled thicker on one side and thinner on the other side. The rolling pin should freely roll between the fingers of both the hands. If dough starts sticking, lift the paratha and turn the side but do not change the direction of the rolling pin and roll the paratha. Roast the parathas properly applying sufficient oil and turning the sides. Serve hot Aloo Parathas with any raita of choice. hai gayatri garu you have been amazing in utilizing your time with the computer and the internet.....!!! Today I made the Aloo paratha recipe. The taste was wonderful and my family loved it. One comment is that the measures of 1 cup flour was enough for only four parathas. I love that you give such good tips in your vocal commentary. "Mommy when will the lady's face come on the screen." Thanks and please more and more recipes. Thanks Milly Garu!!! Convey my love to the princess at home and tell her that I'm the invisible lady who has dedicated this site for children like her who are solely responsible for their moms to try new and newer recipes at home so as to feed them healthy and fresh food. hai gayatri garu, i just visited ur site to find out how to make aloo parathas, i read the recipe, it was so nicely said like in a very simple way, with the simple language,so nicely. the best thing is u have mentioned the smallest details of what and how to do, u explained very well, readers will not get any more doubts of how to do it once they read ur preparation method. ur site has been helpful for many people many a times. Owe you a huge bundle of thanks for your aloo paratha recipe. I followed your recipe and it turned out great!! Just love your website. Especially your tips help in an impeccable execution. All the very best in your fight against discrimination by SBI. I recently tried your aloo parathas and home made choc. 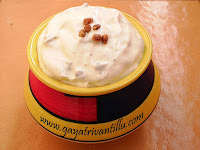 recipes, they turned out to be v.good, ....choclate metthaga vachindi, but tasted v.delicious, ...!